The prune tree originated in the Caucasus, close to the Caspian Sea. The prune came to Europe from there and was brought to the USA in 1856. Today 50 percent of the global dried prune harvest comes from California, but Chile, for example, has made enormous progress as an exporter. 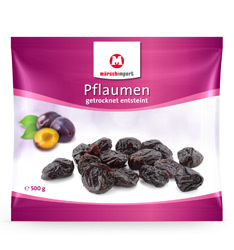 While fresh prunes are picked before they have reached full maturity, dried prunes must be fully matured to preserve the desired fructose. They are then stoned and dried mechanically. The prunes pass through an ingenious system of sensors to avoid any stone fragments. Prunes are seen as an old household remedy to regulate the digestive system. They are used in baked goods, in muesli and in junket or simply as a snack between meals.